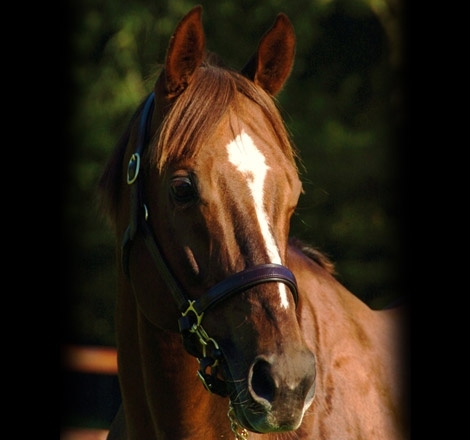 Sire: INDIAN RIDGE - won 5 races, inclGr.2 King&apos;s Stand S, etc. Sire of well over 80 individual Stakes winners, inclIndian Haven, Compton Place (Gr.1, a leading sire),Namid (Gr.1, successful sire), Linngari(Gr.1, successful sire), Definite Article (Gr.1, a leading N.H, sire), Domedriver (Gr.1, sire), Ridgewood Pearl(Gr.1), Indian Ink (Gr.1 at 2 and 3),Daytona (Gr.1), Sleeping Indian(Gr.2, successful sire), Handsome Ridge (Gr.2, sire),Indian Rocket (Gr.2, sire), Munir(Gr.2, sire), etc. Dam: MADAME DUBOIS - rated 121 in Racehorses: wonGr.2 Park Hill Stakes, Gr.2 Prix de Royallieu: dam of 10winners, incl. Indian Haven, Count Dubois (Champion at 2, won Gr.1 Cran Criterium, Champion sire of 2yos): grandam of Imperial Stride (Gr.2 Scottish Derby, Gr.3 September S), High Pitched (Gr.3 St. Simon S, LR Aston Park S, 2nd Gr.3 Geoffrey Freer S, sire), etc. The immediate family of Daggers Drawn (Gr.2 Champagne S, successful sire),Steward (Gr.2 Grand Prix de Chantilly, etc. ), Mores Wells (Gr.3), Endorsement (Gr.3),Milly Moss (Gr.3), etc. 22 Black type performers under the first 3 dams. Won 3 races(6-8f) at 2 and 3years, £173, 167. WON Gr.1 Irish 2,000 Guineas, 8f, The Curragh, beating Tout Seul (Gr.1), Zafeen (Gr.1), Solskjaer (Gr.2), Evolving Tactics (Gr.2), France (Gr.3), Saturn (Gr.3), Abunawwas (Gr.3), Makhlab (Gr.3), etc. WON LR European Free Handicap, 7f, Newmarket, beating Baron's Pit (Gr.2), Membership (Gr.3), etc. "The Free Handicap, in which Indian Haven showed a tremendous turn of foot to win by two and a half lengths from Baron's Pit.... The tall good-bodied Indian Haven, who fetched 62,000gns as a yearling, acts on good to firm and good to soft going, and he is usually waited with. He stays a mile." ASPEN DARLING, £140,000, wonGr.3 Firth of Clyde Stakes, 2nd Gr.1 Cheveley Park Stakes, 3rdLR Marygate Stakes, LR Hilary Needler Stakes, all at 2years.ASHRAM, won Gr.3 Somerville Tattersall Stakes, at 2years: 5wins £113,000.BEACHFIRE, won 5 races, incl: LR Wolferton Stakes, Royal Ascot, £85,000: Rated 112 DRAGON FIGHTER, £95,000; 2nd Gr.2 Railway Stakes, 4thGr.1 Phoenix Stakes, Gr.3 Sirenia S, all at 2years. PEPPER POPPER, 2nd LR Premio Natale di Roma, 3rd LRPremio Signorino, TELLOVOI, LR Premio Tullio Rughetti, LORD OF DANCE, (10 wins), SU CONTADORI, (8 wins), CLASSICALLY, (4 wins), INDIAN JACK, (4 wins),ANGELINA BALLERINA, (5 wins), etc. Over 50% Multiple Winners to Runners. FIRST RUNNERS OVER JUMPS ARE WINNING! FAIRYINTHEWIND, (2NH wins), BEACHFIRE, etc. OUTSTANDING VALUE AT: £2,500 (1st October terms).